Blondie and Brownie: Twice Fried Cherry Pies Return at Chip Shop! The other night I met up with a friend for dinner at the ChipShop. We worked out way through a couple of my on menu favorites--the Wild Mushroom Mac & Cheese and the Curried Chicken over Chips. When it came time for dessert, I happened to glance in the direction of the specials board and noticed that the Twice Fried Cherry Pies were back in action. Score! 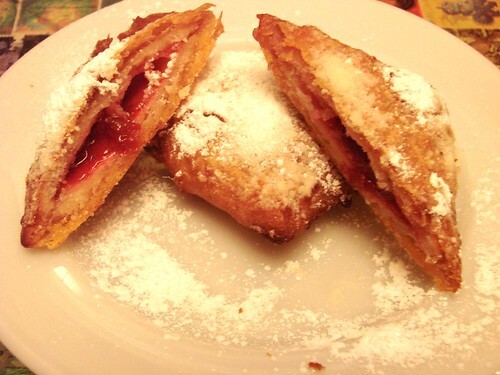 They take two Hostess Cherry Pies, batter them in a lightly sweetened batter and deep fry them. It's diabolically delicious. Even my friend, who doesn't normally like cherry pie, couldn't resist. You can still taste the sweet original fried pie crust you remember from your childhood, the additional ChipShop batter just takes it to another whole level of friedom. 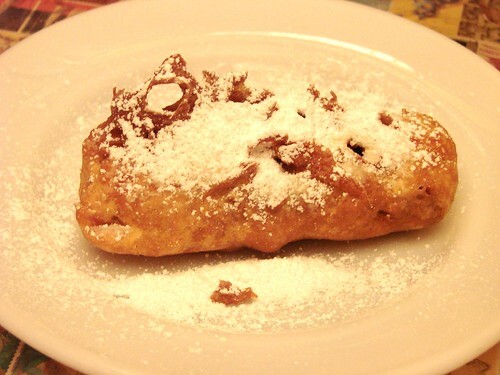 The fried Snickers that we also shared for dessert was also delicious--how could it not be? But of the desserts I've tried at the ChipShop, the Twice Fried Cherry Pie is tops! 383 Fifth Ave. at 6th St.
Sun 11:00am-10:00pm - They serve a full English breakfast on the weekends!